Has BPMN Slowed Down the Adoption of BPM? Resolved Has BPMN Slowed Down the Adoption of BPM? Would you say that BPMN has slowed down the adoption of BPM for many companies? First most a great, inspiring and healthy 2017!! I believe that it at least has obscured big time what BPM is all about... But that would go for any narrow focused attempt. As many still see notation, or perhaps "mapping processes" as the equivalent of BPM, use it occasionally depending what kind of process evangelist is around... Most of the time though originating from the silicon corner, so you end up with a subset of what added value BPM could mean for your business... A pity. Distracted from it in some instances (consultants usually involved), but not slowed down. BPMN is something that can be helpful to a BPM initiative when used, employed in the right time and place of a project. It's only when some insist on belaboring "as-is," "to-be," etc. to the exclusion of other efforts and exercises that both - BPMN and BPM - get a bad name, leave a bad taste in clients' mouths. BPMN is one of multiple means to an end, it is not an end in and of itself as many have so wrongfully used it in the past. As Walter notes, there is a risk of focusing too narrowly in any complex sphere but I would not lay that at the doors of BPMN. The hardest things in BPM (or business generally) are communicating clearly and purposefully in order to allow multiple people to collaborate successfully. A precise and well understood common language can only help that surely? And in the absence of one of those we make do with BPMN et al ;-). I think BPMN's original promise was wider than real. The "everyone will be able to model a process" was not accurate nor realistic. A Manager needs high level models, a process analyst more detail and for the final implementation in a BPM Suite, much more details. So, the standard becomes something not so easy for a manager, not so complete for implementation, and not so standard between tools. Said that, I believe that having a standard notation, widely accepted, not only did not slow down adoption, it helped adoption. At least now everyone talks "the same language" when modeling. Do you remember the time before BPMN? We had several ways of representing a process, each tool had their own, we had to train customers in the modeling language (besides the tools). In sum, the world is not perfect, BPMN is particularly imperfect, but the BPM world is better with BPMN than without it. And, amazing 2017 to everyone ! Interesting Juan your comment that an original purpose of BPMN was that "everyone will be able to model a process" . . . which recalls the original reception of COBOL such that business managers would be able to write programs. Peter, I don't see BPMN as the culprit. Over the 10+ years I've been involved in BPM I have seen massive adoption. But there are many still just learning about BPM and its potential and value. I think ultimately adoption is a function of a willingness to change, and we all know change is hard, especially in organizations where multiple people must work together to make change happen. BPMN simplifies change because it makes it easier to approach process modelling. Everyone's always looking for a panacea or new shiny bauble, BPMN was just one in a long line. Unquestionably, the BPMN standard has harmed the progress of human organizational process support. Evidence for this can be seen in the BPM awards that are judged every year. Last year none of the use cases describe their process using a BPMN diagram, and the reason is clear. BPMN has become a diagram of a small part of the computing environment, and not the actual process that people encounter and interact with. When the original BPMN effort was started, the point was to provide an open ended vocabulary to help make expressions consistent across the various graphical notations that existed. This was a laudable effort. Then the OMG got a hold of the standard, a collective of server integration experts, and decided to convert it to a visual programming language focusing for the narrow domain of servers and computer systems. BPMN followed in the footsteps of the failed BPEL to be a programming language for server to server communication. BPMN's advance as an effective programming language required that it become almost -- but not quite -- as cryptic as Java/C++ to the intended business audience. As a server programming language it is not bad. That is not the problem. The consuming public trust in a standard that purports to be for business users, but in fact is a programming language. The idea that there would be ONE language for all uses gets in the way of solving the real problems. BPMN is often mis-applied when it comes to organizational problems, and that gets in the way of getting good processes defined. Vendors are spread across the board. Many vendors provide quite capable offerings, but if a vendor is good, it is generally in spite of BPMN and not because of it. We will know when we hit on the right visual description when we find people actually use it to describe their processes in casual conversation and in all other situation that people describe processes: such as BPM use cases selected for recognition for being outstanding efforts. It is time to start thinking of what the human processes will look like in a post-BPMN world. If it could sound depressive, it might be also a time to think on how machine processes will look in a post-human world.. With throughout robotics, uprising IoT, self driven cars and copters, the prospect doesn't look entirely unreal. Ironically BPMN might appear as an ideal match for this parallel universe. Sure that BPMN is not the culprit, because BPMN is the victim. As Patrick said “BPMN is one of multiple means to an end” thus all those “means” must be considered together in the scope of a BPM reference model and BPM reference architectures. Only then standardised. Nevertheless, BPMN has the positive effect for building a voice of angry customers for having better standards in BPM. Agree with Keith re “start-thinking” if there will be a guarantee for non-repeating of previous mistakes. I'm agreeing with Keith Swenson on this one... I have found BPMN to be very good at capturing the essence of Structured Business Processes, but once you delve into details it can become cumbersome. This impacts the adoption of BPM, because folks quickly associate "It's hard to describe with BPMN what's really happening" with "BPM isn't going to help my company". With many companies, the promise of BPM is sold with BPMN, but then they find their implementation projects requiring "a lot of cruft" to make them work. BPMN really does help, but equating BPM === BPMN has caused a lot of headaches and buyers remorse. There is always a strong correlation between ability to model reality (model fidelity) and complexity of the modelling language (model resolution). And the same applies to any programming language. Specifically to BPMN, I agree that BPM is different from BPMN, main difference is in the scope for data. The stated benefits of process modelling and process standards are dubious. Process modelling standards such as BPMN(2) and CMMN often appear to deliver benefits for the BPM business analyst rather than for the actual BPM customer. Process standards have acted as a barrier to BPM adoption adding increased training costs and complexity for prospective customers. The BPMN days are numbered however. RPAs for example eliminate process modelling and offer an alternative way of designing processes using a watch, learn, do approach that is more intuitive and can be quickly adopted and understood by RPA users. RPA does not eliminate process modelling by analysts. And frankly they use, for their modelling language, a primitive subset of... BPMN (shocker, right?!). I mean, MOST of the RPA tools! I don't get why analysts building plan-side process models need to work any differently relative to run-time functional department end users, other than to set task routing to "all " so they don't need to pick a different skill at each process step when piano-playing a compiled template from a process map. Clearly, analysts don't need a production level of detail, and end users need to be kept away from rule set builders. Aside from this, what am I missing? As Keith says, BPMN "is a programming language". Functional unit members do not like to have to learn any language when there are options that do not require learning a language/notation. Here's the essence of "business management" today. Functional units need ways and means of "managing their operations via processes" not "managing the businesses via processes". The latter is not their job. Top management, on the other hand, needs to focus on evolving strategies/setting KPIs that make good use of infrastructure/resources, with a view to increasing competitive advantage. Strategy meets Operations on the way down via ROI authorizations or annual budget provisions. Operations meets Strategy on the way up via Case goals/objectives that are supportive of strategy. Processes are a subset of Cases (the ratio of structured work versus unstructured work at any Case can go from 5/95% to 95/5%). Overall, managing a business involves regular monitoring of KPIs. It helps to be tracking the right things and since things change, top management needs tools that allow them to challenge KPIs they have set and challenge KPI trends. "Steering the ship", IMO, requires regular scanning of the horizon and the best way to do this is to park your infrastructure/initiatives and KPIs in a free-form -search knowledge base. Take the time to click on "Steering the ship - the new business management reality" below. Love the "steering the ship" reference (and blog post too) -- the very essence of cybernetics too (i.e. "the steersman"). Gets to the core of the meaning of management. I admire the summary by @Keith Swenson above. My opinion might be a bit biased because I relate to OMG efforts on BPMN through my association with BPMN Model Interchange Working Group (BPMN MIWG). Its relevance in its subject domain is evidenced with its wide acceptance through all major BPM vendors and impressive capabilities of model interchange between all these vendors (over 20 vendors at the moment). 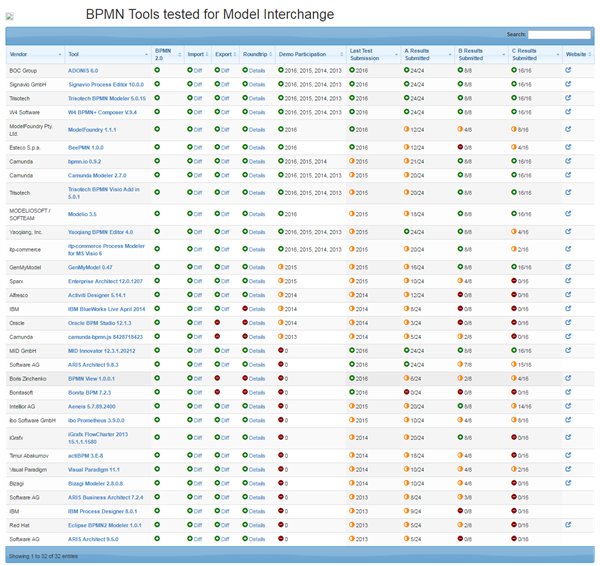 You can find vendor list here: BPMN Tools tested for Model Interchange . I suppose all confusion about BPMN is related with its falsely understood universal appeal. As a result, BPMN is often used in modeling areas, for which it has not been originally developed or targeted. It is the case for every modeling notation, not for BPMN only. In fact, there are currently at least 200 common BPM notations around. At least, ARIS methodology includes approximately this amount. Every notation is relevant and targeted to its application area and can also be misinterpreted in other areas, where it is not relevant. I believe that BPMN has played and plays very positive role in popularization of BPM in general and its wider adoption. However, it simultaneously felt a victim of its own popularity, as it always happens with every popular trend. As a result, it was widely misused by numerous followers, which caused justified criticism by experts. As any practical and democratic movement, often far from academia, BPMN is used (or misused) by many small companies to solve their practical BPM problems. This natural usage alone should result in a gradual evolution of BPMN where it will eventually fill its perfect niche of relevant use cases and applications. BPM is a rapidly growing family of notations and standards. BPMN is a notable member in this family, not more, nor less. What if the impact of BPMN on BPM technology adoption by business is a "J" curve? Right now there are lots of reasons to be discouraged about BPMN. But have faith. Because BPMN deployed as executable can get rid of the round-trip problem, the single biggest impediment to BPM technology adoption. And just as it has taken a long, long time for accounting technology and discourse to permeate business, so too does it take a long time for any new business technology to be adopted. But BPM will be adopted, because it is the technology concerning, by definition, the work of business. But which BPM technology or language? BPMN, warts and all, is today's BPM technology instantiation that has momentum and possibility. Consider the alternatives or substitutes. All alternatives to BPMN impose greater risks and costs on any given organization. How about this slogan for 2017: "All in for BPMN". It's not really about BPMN. It's about empowering business analysts with business managers to produce new business process capabilities rapidly and frequently. The door is open for the committed organization. I agree it takes a long time for any new technology to be adopted. I wonder though how “new” BPM is? - I figure it goes back to CPM (on or before 1957). CPM had/has nodes, directional arcs, loopbacks, and go-to/come from. Sure, it was/is deterministic (i.e. branching is accommodated but with the presumption that all sub-paths will be navigated). Except that, as in Case today, you can within CPM skip steps, perform steps in a different sequence, perform steps not yet current and, by appending flowgraph fragments, re-visit already completed tasks. We never found in our “workflow management” products, any need for much more than node, directional arc, loopback, go-to/come-from. Notice the absence of branching decision boxes (where you exit along one sub-path, or several, or all, on the basis of data and rules). Why is this very important construct missing? Reason: You can invent a decision box by lassoing two or more nodes to create a decision box, attaching a form to each node and parking a rule set at each node so that each node is able to “fire” under the right conditions. Also excluded are rules, forms, form fields, required performance skill, as these are all attributes of nodes. All in all, not much to worry about when building a flowgraph or, worst case, when having to re-build a flowgraph if you leave one mapping environment to go to another. It would be good to hear more on “alternatives to BPMN impose greater risks and costs on any given organization”. Not one of my customers deplores their lack of use of BPMN. They are much more focused on how their run-time environments auto-schedule, level and balance workload across Cases and knowledge workers, how the environment builds an auto-history for each Case, and how they can export/import data in real time to and from the outside world. Good analysis Walter and good question. How about this -- "customer don't know what they are missing". I'm not trying to be facetious though. BPM has never really had "lift off" because once business people learned about all the coding required for executability, they realized that they really didn't have much more than a diagramming tool. Nothing revolutionary. Now however the shoe is on the other foot with the potential elimination of the roundtripping problem; whereas BPM used to be more risky, it is (with executability) now less risky than proprietary notations, partial notations, code-based solutions etc. etc. Agree - "they really didn't have much more than a diagramming tool." - about as useful as jumping half way across a chasm. Re ". . . all the coding required for executability,"
Not so long ago, I would give live demos of "one-click-to-compile" and some would jump up and say the demo was rigged. The way we handled these objections was to copy/rename the flow graph, erase the original, go into SQL Studio Manager, erase ALL template records, go back into the mapping environment, compile the copy and show them the run time template records generated. Accordingly, a return to basics may be in order i.e. What methodologies/tools are needed for the management of work as we see it today, how should these be used? See anything missing in the following? Basic requirements for Success with BPM. 1. Some of the work to be performed involves the performance of tasks in logical sequence. 2. The work will be performed more than once (otherwise use Critical Path Method). 3. The benefits vary such that, for a large initiative, it is advisable to prepare an ROI or SROI. 4. The more complex the sequencing, the more specialized the tasks (requiring specific skill sets), the more beneficial it becomes to go beyond paper mapping to have an in-line implementation of a process (as opposed to an off-line or on-line implementation). 5. The run-time environment hosting instances of templates (i.e. compiled flowgraphs) needs to be able to accommodate re-visiting already committed tasks, recording data at tasks not-yet-current along their instances, and ad hoc intervention insertions at the environment. d) data logging for possible machine analysis to allow process owners to improve their processes; data import/export to increase the reach of the run time environment. 7. Reasonable accommodation to deviate from the sequencing of steps, but with governance from rule sets along instance pathways and at the environment (typically Case) to "rein in" extreme, unwanted deviations away from "best practices protocols" i.e. guidance from BPM, governance from the environment. [the highway example of center lines to provide guidance and guardrails on both sides for governance is helpful]. 8. The environment selected must have a simple User Interface, otherwise the initiative will fail. 9. Adequate training must be provided. 10. For whatever reason (lack of time, inability to "think" process), bring in a facilitator for a short period of time. On-site visits may be necessary with some clients (1-2 days) but the recommended balance of work should reasonably be capable of being done as a series of several one-hour GoToMeeting or equivalent sessions per week. 11. Advanced capabilities include: bi-directional data exchange with local and remote 3rd party systems and applications; predictive analytics for improved decision-making and consolidation of run-time data to a free-form-search corporate Knowledge Base that hosts corporate assets, strategies and KPIs. Adopting BPM does require knowledge of how the supporting software will deliver from the input from business users. BPMN was an early attempt to simplify but still remained a bit of a mystery to users and in hands of "technical" people. This will have held back wider adoption of BPM. Hopefully it will fade into history as new proven "no code" supporting software in hands of business begins to take over. However our experience has highlights huge challenges as it will be very disruptive and change the business model of the supply chain...long over due putting the business customer in control of their business processes....just a question of time...? Unsurprisingly, I disagree with the somewhat prevailing view that BPMN has slowed down adoption of BPM.... I mean, what was the alternative that would have accelerated BPM adoption? Visio? The big fat proprietary BPMS's? I for one have not yet encountered major limitations of BPMN and we continue to offer full process logic via BPMN (and the sister standards) - it's catchy at our customers and makes debugging a breeze. It is again far too seductive to blame the technology for the failure of what is ultimately a social project: change management. There are a dozen, or maybe dozens, of pithy tweets waiting to be released from @Bogdan's marvellous meditation on the state of business process technology. How often does truth and wit get combined with such entertaining force? Maybe this is a "sign" -- that 2017 will be the best year yet for BPM. Inches for sure, but real and steady progress. And where's the leverage point? It kind of boils down to sales! Sales in the most expansive definition for sure, but sales nevertheless. I just tweeted the following, which seems to capture the moment . . .
John, it might be a bit older quote on the same subject: Gottfried Leibniz, 1710: "the best of all possible worlds" (https://en.wikipedia.org/wiki/Best_of_all_possible_worlds). Bogdan, I m happy you mentioned Visio! All Gartner questionnaires consistently show Visio as by far most popular entry level BPM solution. Many advanced BPM tools rely on Visio capabilities. So, Visio, along with BPMN (which it natively supports), are two wide spread trends for wider BPM adoption, event despite trade-offs of this situation. @Boris, for me BPM adoption includes execution. I know that some BPM tools rely on Visio as the modeller. I am not aware how automated is the effort to convert the model into executable code. To me this is critical for adoption. There's tons of great free tools for modelling - the problem lies in the way one gets those visual models to the executable stage. @Boris, also you kinda implied that Visio is used because it is BPMN-compatible, so... is BPMN responsible for the widespread adoption of Visio as a process modelling tool? @Bogdan, I was meaning Visio in modeling context only. Alas, Microsoft itself did not care to bridge Visio to BPMN execution. Multiple companies provide Visio plugins to author executable models in Visio. I will avoid exact names because the list might appear incomplete and also to avoid accusations on alleged association with any one mentioned. +1 Bogdan - re: ". . . the problem lies in the way one gets those visual models to the executable stage"
For me, Visio is a dead end unless you can find/build a compiler for your maps that outputs templates you can use to generate instances in a run-time workflow management environment. Why would anyone want to do this when process mapping needs go far beyond than shapes/connectors (i..e step instructions, forms at steps, pre-processing rules upstream from steps, rules at forms, rules at form fields within forms, step skill routings, imposed time delays at steps), all of which are likely to be available in the plan side process mapping environment provided by an off-the-shelf Case Management or BPMs? Can't find a BPMs that suits your needs? Just as one can, of course, undertake to develop the next generation Ferrari in one's garage, a software developer group can undertake to build a Case/BPMs software suite (process mapping, run time Case management), but unless they are way more clever that the companies who have already done this, ending up with 1,500,000 line code sets, they are in for a long haul and big bucks before their BPMs will see the light of day. c) supervisor leveling and balancing across users. The big debate about the gap between model and executable appears multiple times in this discussion on BPMN and BPM. The executability question would be worth exploring as a separate question. Specifically the question of executability is a question of an emergent property of a BPM engine. We have discussed this somewhat unsatisfactorily in discussions last year (not sure the specific reference). One can have business-sensible process model. But whether any given BPM engine will be good at executing that sensible pattern is a not guaranteed. Resolving graph dependencies in real time where the dependencies are complex in time and process space is non-trivial. The BPEL answer was to "turn everything into blocks", which guarantees executability at the severe cost of artificial process model restrictions. BPMN gives you more freedom for sure. (It might even be "Turing-complete", at least in the imagination.) But the "engine is the thing" -- it's not a matter of "building a compiler for Visio". Perhaps some more mathematically inclined participants can weigh in; I only see the frustration in end-users who don't understand why they can do some sensible things but not others. And having to think about artificial restrictions has a very high cost. +1 John . . .
"Case" to the rescue here . . . .
Before BPM, people were able to manage businesses. BPM processes/process fragments hosted in Case do not present a problem - you can skip steps, re-visit already committed steps, record data at steps not yet current and insert steps because inherent to BPM is orchestration and some governance (depending on what your definition of BPM is). The Case environment hosting Work provides the rest of required governance, both in the form of Case-level rules and all - powerful Case Managers who can hold up, enable or close a Case (that is what they get paid to do). @Karl, I am not sure that it is relevant to claim Visio dead. In terms of client installations, Visio overlaps all BPM systems put together by a number of orders. Executable or not, people draw a lot of diagrams in Visio. I am not sure, if people think about BPM when they draw these diagrams but, as a rule, diagrams are drawn for business purposes, not for a joy or entertainment. Hence, Visio drawings predominantly describe business processes in one or another form. Not accidentally, most leading BPM tools offer import of Visio files. @ John, I completely agree with your point on executable processes. Some processes are executable, some - not, simply by definition. Moreover, it is unlikely that any single system will be ever capable to host and run all processes of a company. Even such giants as SAP do not come even close to this. Success of a BPM platform is ultimately defined by its standardization and universal connectivity. Companies and, especially, large corporations have too versatile IT and business environments to expect any single monolith BPM being ever able to substitute all this abundance of technologies. However, wisely built BPM based on open standards could greatly facilitate integration of these systems and improvement of their natively executed processes. I have pointed out in various rants that consultants who have clients willing to buy time from them need to be "allowed" to earn a living using whatever methods/tools work for them and their clients. I suppose Civerex's product suite is "a big fat proprietary BPMS" (we call it a Case Management System) except that we offer it free to consultants. End clients contract direct with us to rent, lease, do a private label, or buy the source and go away with this. One consulting firm who took us up on our offer, negotiated a $3,500,000 US contract with his client - we billed the client $450,000 for software licenses. Not bad, for both of us was my take. The real problem is I have never used BPMN and BPMN specialists probably have never used the Civerex software. It might be instructive to have some independent person playing the role of "customer", send a set of images of forms the customer routinely uses to two vendors, (about 100 images), then, at a go to meeting, on the fly, the customer describes a process we do a cake-bake to see who "finishes" first and what they actually end up with. A workflow comprising 20-30 steps with a few branching decision boxes should be sufficient to build a workflow, compile it, run it, make a few changes, recompile/roll out within a 1 hour time limit. We all might learn something . . .
Hi Karl, I wasn't targeting your software - I was looking at the Pega/Appian/IBM trio. But, if the fundamental problem we are debating is "adoption", then for sure having USD 3.5 M bills gets you a lucrative business, not widespread adoption. As for the comparison you suggest - you are proposing a stand-off between a tool and a modelling standard. Considering that BPMN does not have interfaces and data modelling in its scope, this is not a telling comparison. Mind you, I am not against proprietary code - you need your own architectural sauce to wrap processes, data and interfaces into something that will add value to your customers. But I find it disingenuous to blame an open standard for choking an industry that is dominated (value-wise) by proprietary platforms. @Bogdan "industry that is dominated (value-wise) by proprietary platforms." - this is a resume of this discussion. I think that BPM in its current situation is not "fit" for modern business challenges and opportunities. @Alexander ... Agree with "BPM in its current situation . .. " except that no one has said we must use BPM and only BPM for "modern business challenges and opportunities". So, BPM. hosted in Case, with the tools I use ... Case level governance, CPM, CEM, ECM, RALB, FOMM, interoperability, data mining, and data consolidation to Kbases\KPIs, address many operational needs. Separate from this we have corporate asset management, strategy formulation, identification of initiatives, prioritization of initiatives, allocation of funds, and periodic review/connect-the-dots of KPIs\initiatives\strategy. I don't include predictive analytics or AI because I am not currently able to get that working for my customers. 2017? I recognised the driver would be BPM which was a logical step for me as I was mapping out processes in the 70s and what an eye opener that was...and fun! So it is back to basics as business logic never changes. Of course IoT AI etc creating data will continue to evolve but all fit into the end to end process where people run the business...and where this new capability will dominate in due course....but will face challenges from some huge vested interests...just a question of time...? The good news is MDE and no low code is rapidly rising up in profile and for enterprise the BPM discipline will be the driver for all operational needs. @David.... Very similar experience (doing process mapping for a living back in the 1970s). In the heavy construction business (pulp and paper, hydro, refineries, cement, steel . . ) all staff from from level one up to the CEO had a process map on their wall and referred to it regularly. The maps got marked up to show progress and, in the early days, the project managers received a 6 inch thick task list printout with plan start/finish and actual or expected start/finish. Routings at tasks were routine because forward calculations included resource leveling and balancing (plus automatic stretchout of the timeline when a resource pool went dry). So, is anything different today for folks who work in consulting engineering? Not much that I can see aside from breakaway from deterministic mapping plus the fact that maps were updated weekly to show progress whereas today, they get updated on-line, in real-time. As for 13 work tasks, our respective product offerings clearly work differently from yours, but, no worries, the end result probably is very similar. i.e. non-tech silo dwellers are able to map out their own processes and BI or IT staff continue to take care of bridging across silos and providing inter-connectivity between local and external system and applications (including, today, 'devices" . 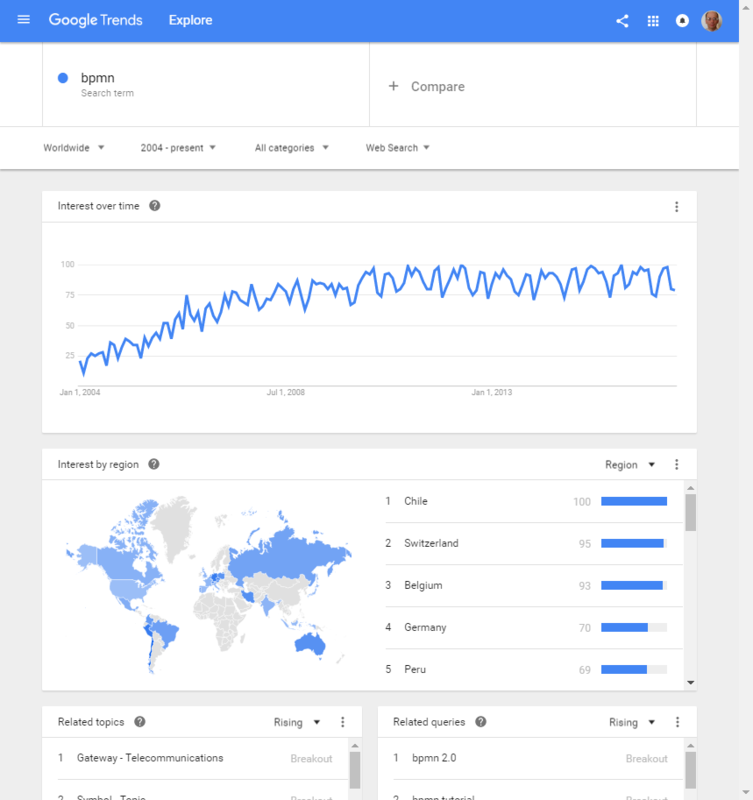 According to Google trends, popularity of BPMN steadily grew from 2004 to 2008 and remains on roughly same level over all past decade. Not every technology can celebrate this sort of stability over such a time span. It is hard to tell, if it will decrease or rise in future but, objectively, at the moment nothing indicates BPMN’s demise in public sentiments. Vox Populi, Vox Dei. BPMN moved BPM further away from Business and closer to the IT dept. If "BPM" started with BPMN, then trending away from BPMN has resulted in distancing the IT dept from BPM.